What I find interesting is that, by overlaying these three images in a way that strips them of all recognition (except for certain bits of text) it creates quite the opposite of escape and calm — the lines collide and intersect to impress a feeling of disorder and claustrophobia. But when certain phrases pop out that are hidden within, you imagine the bits from your own childhood — strolling down a bustling boardwalk, festooned with flashing lights and bright signs, the sounds and scents and all sorts of distractions that, when remembered, seem so perfect. 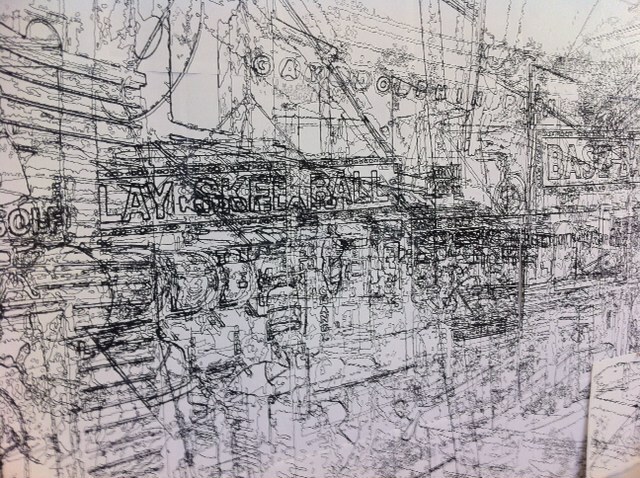 Looking into Gainer’s drawing, it’s almost like seeing visually a blueprint of how your brain recalls a memory. « Get your Jam on! You are currently reading Lee Gainer — Escape at .